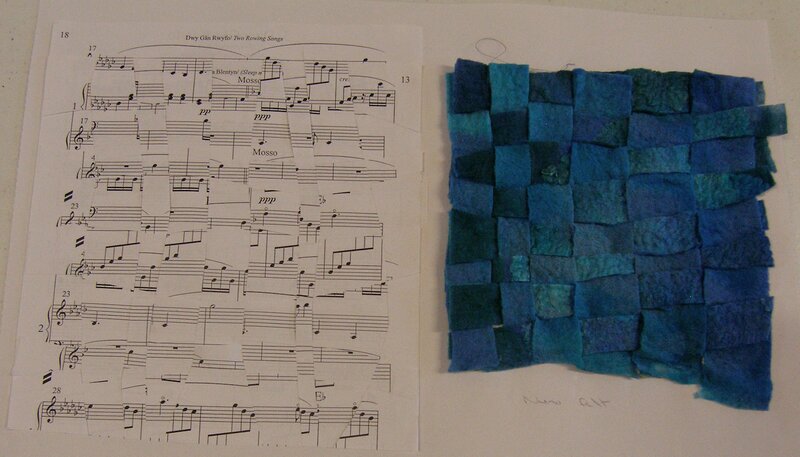 The first part of exercise 1 is to form a warp and weft with 2 squares of paper and interweave them. Then to repeat the exercise but varying the materials used. 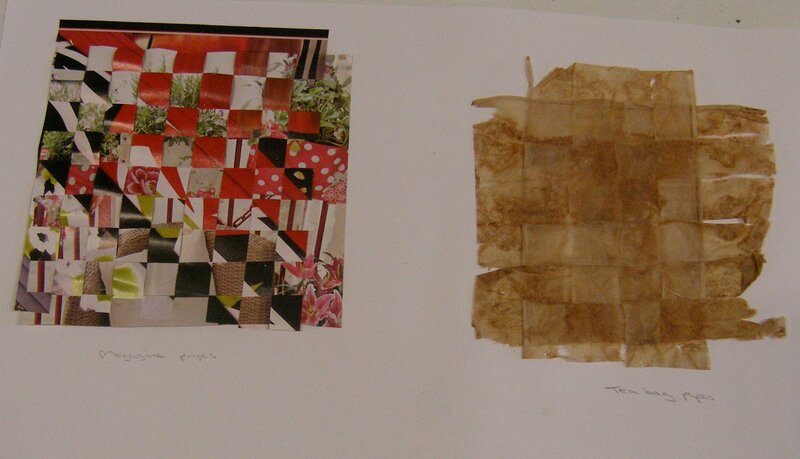 The first photo shows the initial sample on the left, made from magazine pages. On the right is tea bag papers. The next samples experiment with contrasting materials. 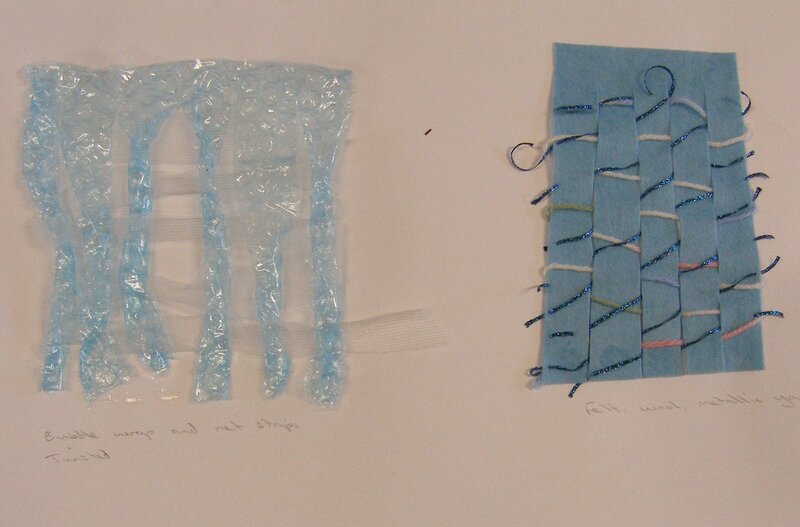 On the left is bubble wrap which is twisted, interwoven with this is strips of net. The right hand sample has a felt warp with the weft of wool. Metallic yarn has then been worked through on the diagonal to provide contrast in shape and texture. On the left below are pages of sheet music. These would work better if the angle of the weft had been rotated 90 degrees to give greater contrast between the directions on the printed music. On the right is a recycled piece of nuno felted fabric that I made, with the front and reverse sides being used to contrast the texture. The left sample below is my favourite. It combines a piece of calico that I marbled and black velvet fabric. The velvet has only been worked through strips in the central area of the calico so the calico provides a border all around. This sample provides great contrast between the texture of the velvet and that of the calico, a colour contrast between the purple/bronze metallics against black and also the contrast between light and dark. 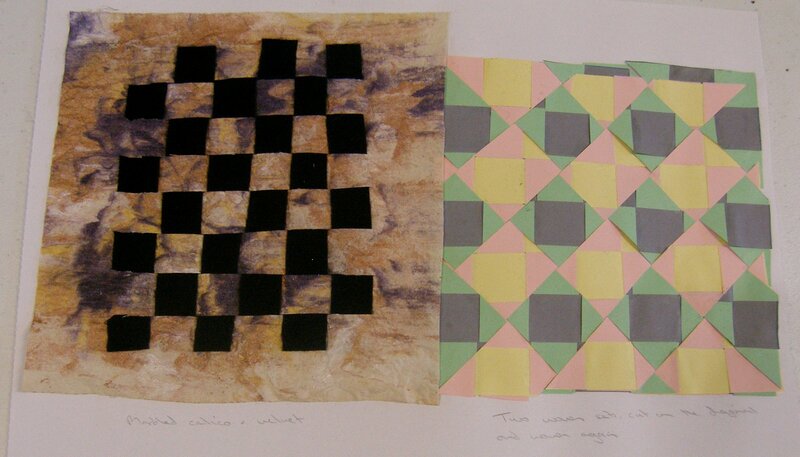 On the right is a double woven sample made using coloured paper. I worked 2 separate pieces, then cut those into strips on the diagonal and wove them through again.